Rena & Briana at an elementary outreach concert. We Bella’s have a great deal of experience in educational settings. Each of the individual us have been teaching for more years than we can count! On top of that, we’ve put together an educational, informative, and fun musical outreach program suitable for any grade, age, or musical level. From elementary students to folks enjoying their retirement and everything in between, we have a special, tailor made program for you. 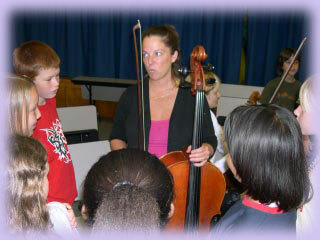 Sharon at an elementary school outreach concert.